It’s their beer #29 – and Snakebite sent a shiver down my spine with vague memories of long nights and late mornings. This is a 650ml bottle that has beer of 5.6% ABV, which is about 168 calories a serve size, and the whole is 2.87 standard drink units worth. A collaboration with our cider making friends at Cider Riot! and our brewer friends at Beau’s All Natural Brewing. Snakebite really is 2/3 Kölsch and 1/3 cider fermented together with a touch of black currant. 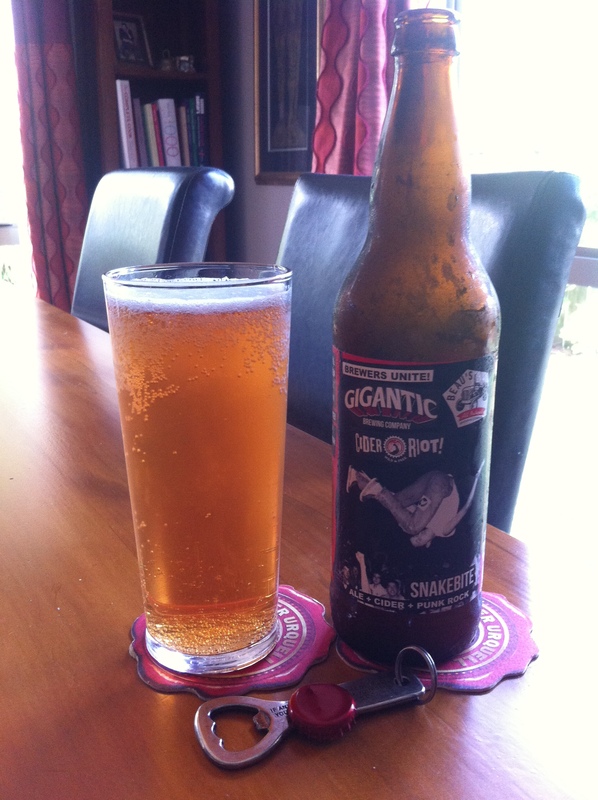 The result is light and effervescent, with a cidery fruit character, light hoppiness and a tart, fruity finish. Posh Spice loves to drink snakebites! So, what could possibly go wrong? An almost mystical concoction the Snakebite was refused in many establishment as measurement of the ingredients wasn’t exact, and the British are very strict about beer measurement. Still that never stopped us on many occasions. Aroma is neither a one thing or another, the Kolsch aroma is the one I’d pick, as if I thought there would be two aromas. Tinged with blackcurrant this is an interesting colour n the glass, and without much of a head to speak of really. Aroma still that faint damp grass thing that I associate with lager types. Earthy. And all that trepidation and frankly the taste was a bit of a let down, I’ve built this up in my mind to be something it isn’t and something I don’t remember. It is like a thin sour saison type beer. Honest I was disappointed. It is way to placid to be “punk rock” it’s like a pensioner version remembers, and then really didn’t remember, this is a travesty really, and that’s the harshest I can be about a memory they promised. The beer, all that aside, is soft, mellow, slightly sour, but lacks body and middle, with a finish that is trying to be dry but can’t quite muster, The Kölsch way to soft to carry it off really. I’ll put the punk rock albums away for another day. Where did I get it? Liquorland in Forrest Hill have these, although they should be in good places. Am I enjoying it? Not really, it’s disappointing. Would I have another? Not really, I might make my own and see what happens though. Would I share with a friend on a porch and set the world to rights? I’d soak the label off and we cold talk about that, I’d hate for this to be the beer that you talked up as being your youth, and then be disappointed. The label art is great though. 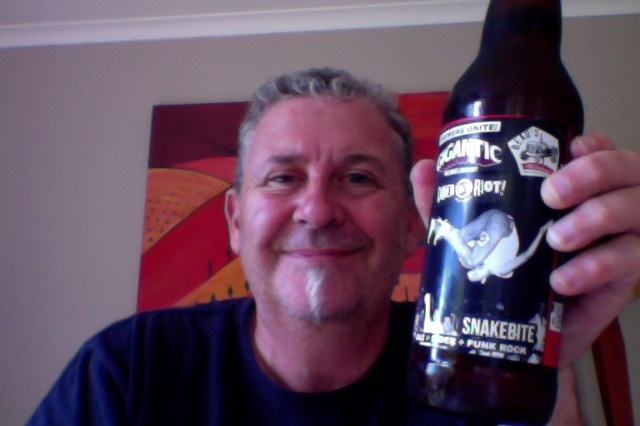 This entry was posted on March 20, 2016 by Philip Walter in Beer, Beer of the USA, Beer Review, Craft Beer, Critic, Fruit Beer, Gigantic, Justsaying and tagged craft beer, Gigantic Brewing Co, Gigantic Snakebite, snakebite.